On Wednesday, dozens of Palestinian, Israeli and international activists, along with several Palestinian civilians, blocked the gates to the recently opened route 4370 expressway for about 30 minutes. The expressway has a 26-foot wall separating Palestinian and Israeli motorists and has been dubbed the ‘apartheid road.’ It was opened earlier this month in the occupied West Bank.The protesters held banners which said, “No to apartheid, no to annexation”. The protesters were suppressed and dispersed by Israeli police who used tear gas and stun grenades on them. Two protesters were arrested and four others were injured. The road has two separate lane. The western lane is exclusively for Israeli Jewish settlers from the nearby illegal settlements in the West Bank, while the eastern lane is for use by the Palestinians living in the occupied West Bank. The Israeli side of the road stretches from route 437 to route 1, just east of Jerusalem, and gives the settlers faster access to the city of Jerusalem. The Palestinian side of the road leads to an underpass that connects to the Palestinian cities of Ramallah and Bethlehem, preventing access to Jerusalem. Palestinians have to obtain permits from the Israeli army to enter Jerusalem, which are usually very hard to get. Israel already has several roads that segregate Israeli and Palestinian traffic, but route 4370 is the first one with an actual physical wall dividing the lanes. A section of route 443 was forbidden for Palestinian vehicles, identified by their green number plates, for eight years till 2010, when the Israeli high court ordered the policy to be terminated. Hey Buddy!, I found this information for you: "Protesters block Israeli apartheid road in West Bank for 30 minutes". 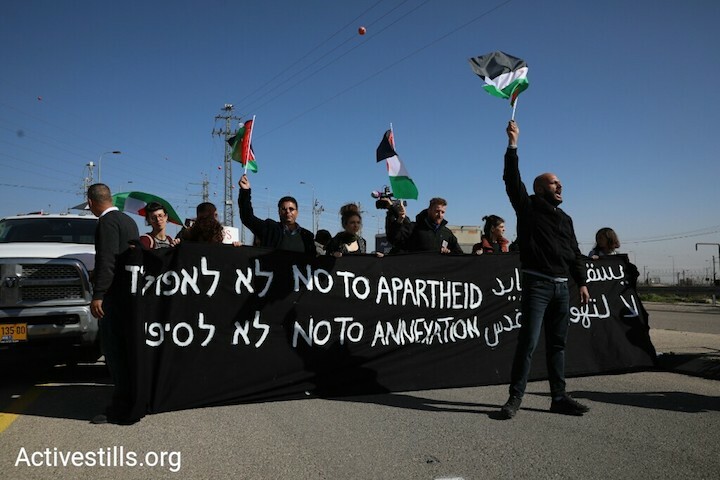 Here is the website link: https://peoplesdispatch.org/2019/01/27/protesters-block-israeli-apartheid-road-in-west-bank-for-30-minutes/. Thank you.